BEIJING, Jun 23 — Wearing white gloves and wielding two pairs of scissors, Mongolia Prime Minister Khurelsukh Ukhnaa and Indian Home Minister Rajnath Singh on June 22, 2018, literally cut a strip of red tape, a move intended to symbolize Mongolia’s first oil refinery to launch its construction. Numerous people gathered to attend the groundbreaking ceremony of a long-awaited project with the help of a USD 1 billion loan from India at Altanshiree soum, Dornogobi province, Mongolia. “Mongolia as an important strategic partner,” Indian Home Affairs Minister Rajnath Singh pointed out. “India wants to realize the huge potential of bilateral relations with Mongolia” he added. In a moment rich with pomp and symbolistics, Khurelsukh Ukhnaa emphasized the importance of the project and proudly proclaimed his decision was “historic”. This word implicates that his effort to accomplish for a tricky task to end the country’s dependence on Russia fuel. Can China win the fight against poverty? A young man in old, graying clothes sits, surrounded by the bustle of Beijing’s central business district, with its towering skyscrapers and opulent hotel lobbies. As formally dressed business people rush by, he sits quietly on a staircase, practices Chinese characters. They pay no attention to him or his dirty bare feet, the calloused soles of which mark him as homeless. He doesn’t seek attention — no begging cup before him — instead, he collects recyclable plastic bottles to make ends meet. He lives on less than $2 per day. A canvas bag full of empty plastic bottles and winter clothes sits behind him; his worldly possessions and income can be carried over his shoulder. His life on the street begins before sunrise, in order to transcribe Buddhist sutras for the whole day. It is apparent he is unschooled when you see his handwriting. As the sun sets and busy white-collar workers are replaced by revelers on a night out, he goes to sleep in a small garden in front of a luxurious hotel. Whether in the heat of summer or the cold of winter, he has done the same things over and over again, for the last four years — ever since he discovered Buddhism. 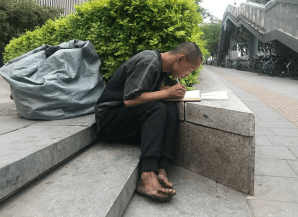 Fang Shixiong, a homeless man, rewrites the Buddhist sutra on the street of Beijing. His name is Fang Shixiong, and his early life in Jilin province was tough. At the age of 5 he was left to fend for himself when his parents passed away. Now 23, he has been homeless for 18 years. A loyal theist, he is one of 30 million people still living under the poverty line. He nervously muttered as he told me his story, often repeating the phrase: “What is happening here?” But when I mentioned Xi Jinping, his eyes began to sparkle, and he started answering my questions with sentences rather than words. “Recently, I have registered as a citizen. Once I have an official ID, I will be allowed to work as a manual laborer. But the procedure will take time, nearly two years,” Fang said. 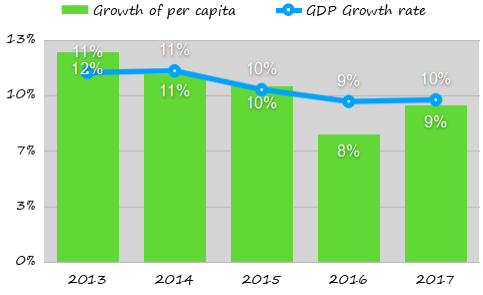 Despite the fact poverty in China has reached its lowest level in the last four decades — with a total below 30 million — that number still roughly equals the entire population of Afghanistan. Chinese President Xi Jinping said China aims to win the battle against poverty by 2020. His speech from the podium at the CPC National Congress had even reached Fang Shixiong, giving him hope for a change in his situation. As Fang shared his story of life on the streets of the capital, hundreds of people were being pulled out of poverty 660 kilometers away in Lankao, a poster county for poverty alleviation. One of the people there is Yan Chunguang, a 31-year-old father of two who lives with his wife and 89-year-old grandmother in a Chinese-style courtyard dwelling. Yan was lucky enough to meet president Xi Jinping during his visit in 2014. A large photo of Xi, taken during his visit, hangs outside the front door for all to see, and also in the living room. He is frequently visited by travelers to Lankao, who wish to learn about the town’s success story. 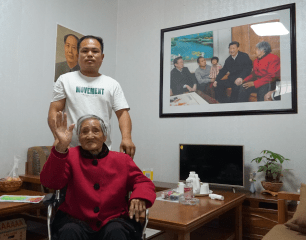 Yan Chunguang, a chicken farmer, stands with his grandmother Zhang Jingzhi in front of their photo with President Xi Jinping. “When General Secretary Xi Jinping visited my family, there was not so much to worry about. We used to have only a thousand chickens, and now that we’ve climbed out of poverty, we have reached 10 thousand chickens,” said Yan, a self-employed chicken farmer. Thanks to local government support, his income rose fivefold over the last four years, and medical insurance has lightened the pressure of health care costs resulting from his grandmother’s hearing loss. His story is only one example of the 68 million people who have been lifted out of poverty in the last five years — as many as the entire population of France. One in four Chinese counties, 592 in total, are classified as impoverished on the national list. A county can be removed from the list if less than 2 to 3 percent of its population lives below the poverty line, defined as a per-capita annual income of 3,200 yuan at 2017 prices, according to the State Council Leading Group Office of Poverty Alleviation and Development. Since China started shortening its list of impoverished counties in 2017, more than 200 counties have made it off the list. Lankao announced its removal from the poverty list in March 2017, the second county to do so after Jinggangshan. Anti-poverty official Xia Gengsheng explained to Xinhua news agency removal from the list does not mean poverty relief efforts will fade away. Subsidies and financial support will continue to ensure stable development of former impoverished areas during the transition period. In Lankao, the municipal government’s poverty alleviation strategies aim to diversify local people’s income sources and reduce dependence on agriculture. 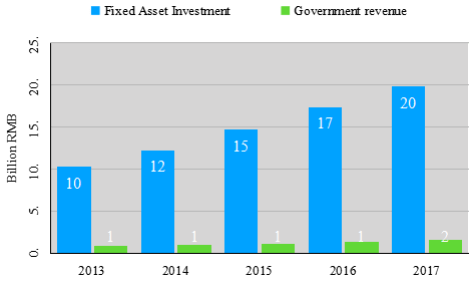 Over the last five years, fixed asset investment and local government revenue doubled to 19.8 and 1.7 billion yuan respectively. Local banks had already issued a total of 357 million yuan in financial support, including interest-free loans and micro-loans. Moreover Everbright Environmental Energy (Lankao) Limited, a subsidiary of Everbright International, started its operation of the first county-level waste-to-energy plant with a total investment of 310 million yuan at the end of 2017. Dingfeng Muye, an Everbright supplier, also opened its fifth wooden chip plant in Lankao. The county is breathing the air of prosperity, with newly opened Starbucks, Adidas and Louis Vuitton stores on the city’s main street. Coincidentally, construction cranes stand on almost every corner, and demolished buildings lay waiting to be rebuilt — an obvious mark of economic growth in Lankao. A year after Lankao announced its withdrawal from the national list of impoverished counties, half of the migrant workers — who had moved away to find better jobs — returned to their hometown, according to local authorities. More than a hundred thousand people have been successfully lifted out of poverty in Lankao during the last three years. However, nearly 10,000 people remain below the poverty line. Other longstanding factors in Lankao’s entrenched poverty remain, for instance environmental problems which have long affected Lankao’s agricultural output. An elderly Lankao resident, who wished to remain anonymous, said her harvest this year ended up wasted because it didn’t meet the Henan government’s requirements for sale. “Thirty percent of the people living under poverty in Lankao are mainly disabled, elderly or adult orphans,” said Li Mingjun, head of Lankao county. In the battle against poverty, China has had remarkable success. When China launched its reform and opening-up policy in the late 1970s, half the population was living in poverty. Today, it’s less than two percent. China has set a goal of lifting 10 million people out of poverty every year from 2016, with the goal of eradicating poverty entirely among the rural population by 2020. For Fang Shixiong and people like him, the hope of one day getting off the street is what inspires them to keep up the fight. The author is a postgraduate student of global business journalism at the School of Journalism and Communication, Tsinghua University. Чонон Сүлд киногоор нь сайн мэдэх Францын найруулагч Jean-Jacques Annaud дараагийн шинэ бүтээл болох Чингис Хаан киногоо China film, Өвөр Монголын кино нэгтгэлийн хамтран бүтээжээ. Тус кино Хятадын зах зээлд дэлгэцэнд гарсан эхний долоо хоногтоо 35 сая юанийн ашиг олж, 2.7 сая хүн үзсэн байна. Энэ орлогын бараг гуравны нэгийг Бээжингээс бүрдүүлжээ. Одоогоор (5-р сарын 04-ний өдрийн байдлаар) Хятадын кино театруудаар гарч байгаа кинонуудын 8-рт бичигдэж байна. Монголын түүхээс сэдэвлэсэн тус киног орчин үеийн залуусын сонирхолд нийцүүлэн хийсний дээр адал явдал, хайрын тухай, бүр тодруулж хэлбэл Бөртэ, Тэмүжин 2-ын дурлалын тухай өгүүлдэг. Vice-ministerial meeting of SCO Afghanistan Liaison Group in Beijing will be held in Beijing in May. Moreover, meetings of political parties, tourism ministers, supreme court judges and the journalists of respective countries supposed to be held before the summit. Jolene! Энэ дууг эхэлж сонсоод дууных нь аяз хамгийн түрүүнд таалагдаж билээ. Тэгээд дараа нь үгийг нь чих тавиад чагнасан ийм үгтэй дуу байхын! Ийм гунигтай дууг ийм хэмнэлтэй аялгуутай хослуулсан нь сонирхолтой санагдаад дууных нь үгийг орчуулан хүргэж байна.